Here's an early Christmas present for ya'll... Mr. Meth AKA Method Man comin' to Emo's, Oct. 22nd fools! Details skimpy but clear your calendars for this one! Props to the Austin team for winning 2nd place at the National Poetry Slam! But I gotta say... what was up with the first judge always giving out 8's... and what was up with the length of the event, my ADD was flaring up... AND finally what was up with the guy in the dress?!? 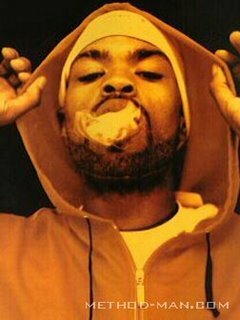 Method Man (born Clifford Smith, April 1, 1971 in Staten Island, New York) is an American rapper and member of the hip hop collective, Wu-Tang Clan. He is also well-known for his work both as a solo artist and with frequent collaborator Redman, as well as for recent forays into acting. Method Man takes his name from The Fearless Young Boxer, also known as Method Man, a 1979 film by Jimmy Shaw starring Peter Chen Lau. Method Man spent a childhood split between separated parents in Staten Island and Long Island, and in an apparent precursor to his career in hip hop was introduced both to playing drums and to poetry by his father. Not only was Method interested in music, he was also fascinated by comic books and particularly Ghost Rider, a fascination which manifested itself years later in several of his many rap aliases. His pre-hip hop adult life was mostly split between drug dealing and low-paid jobs (including a stint working at the Statue Of Liberty, along with future Wu-Tang colleague U-God). After becoming well known on the streets for his rhyming abilities, he joined with 8 friends to form the Wu-Tang Clan in the early 1990s.